Special sessions supplement to the regular program for BMOT2016. Each special session should provide an overview of the state-of-the-art and highlight important research directions in a field of special interest to BMOT participants. 2.The IIAI-AAI 2016 committee will review the proposal after receiving it, and notify the result to the applicant in about one week. If accepted, the applicant to the special session organizer is requested to submit the reviewer list to the special session chair in one week. Moreover, the special session organizer must pay attention to followings. ◾The special session requires at least 5 papers. ◾Please select the best paper of your special session. The best paper will be invited to submit special issues of post conference publications (Special Issues of information Engineering Express Journal (http://iaiai.org/publications/jlist/iee/). ◾All papers will be peer reviewed and accepted papers will appear in the Conference Proceedings to be published by CPS and Conference Proceedings will be submitted to be indexed by EI, INSPEC, DBLP and Thomson ISI. ◾The special session organizer must register to the conference. ◾Special session organizer chairs your special session in the conference. ◾Please pick the “certificate of organizing special session” up at the reception desk of the conference venue. 3.Call-for-paper or other information about the special session will be shown in the following website (http://www.iaiai.org/conference/aai2016/workshops-and-special-sessions/). 4.The organizer will receive the information of schedule and procedures about paper submission and review, publication of the proceedings, and conference management. 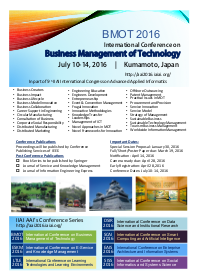 The organizer is requested to utilize the IIAI-AAI 2016 website for paper submission (http://www.iaiai.org/conference/aai-openconf/openconf.php). In the website, the organizer can assign papers to reviewers, and report review results to IIAI-AAI 2016 committee. The organizers can gather people who are interested in the theme you are also interested in, and referee the submitted papers based on your criteria. Some papers in each special session can be nominated for journals. The best paper you choose in each Special Session will be invited to submit special issues of post conference publications (Engineering Express Journal; http://iaiai.org/publications/jlist/iee/). I am sincerely looking forward to your interest and submission to Special Session!